Horizontal Machining Centers Modern Machine Shop 83 Early on, a few spindle crashes occurred, which led to vibration and a spindle replacement. That said, the HMC purchases ultimately have served to boost employee morale. This type of investment sends a clear message to employees about how committed the company is to long-term growth while providing them with quality equipment to enable them to do their jobs more effectively and efficiently. It can be terribly frustrating for a machinist to set up a job on a subpar machine just to remove the first completed part for that run and find out it was not machined to specification. This generally doesn't happen on the HMCs, Mr. Washington notes. In fact, overall shop scrap rate is now less than 0.5 percent. Plus, spindle utilization of as much as 85 percent can be achieved (compared to 40 percent for VMCs) because an operator can set up a job on the pallet outside the machine while another job is currently running on the other pallet. 4. WILL AN HMC HELP ME GROW MY BUSINESS? When Valley Tool purchased its first HMC in 2010, the shop employed 85 people and annual sales were approximately $4 million. It now has five HMCs (four a51nx machines and one Hitachi Seiki it purchased used) and 123 employees, and sales in 2017 were $7.5 million. Some of this can be attributed directly to the addition of HMCs. The shop does not use an outside sales person. However, once word spread through its existing customer base about how its HMCs can produce quality parts faster than VMCs (partly due to reduced setups), the shop began winning additional work. 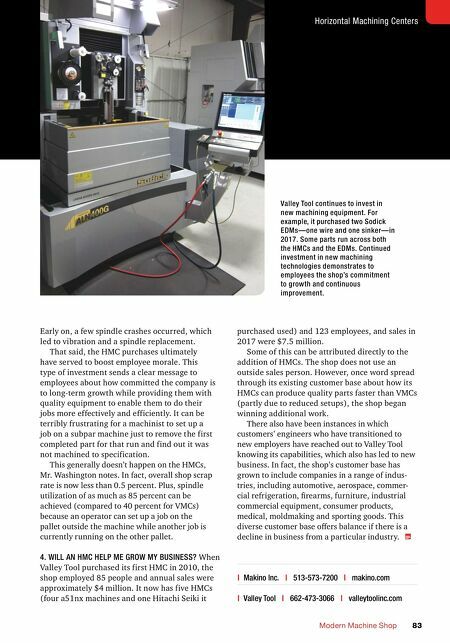 There also have been instances in which customers' engineers who have transitioned to new employers have reached out to Valley Tool knowing its capabilities, which also has led to new business. In fact, the shop's customer base has grown to include companies in a range of indus- tries, including automotive, aerospace, commer- cial refrigeration, firearms, furniture, industrial commercial equipment, consumer products, medical, moldmaking and sporting goods. This diverse customer base offers balance if there is a decline in business from a particular industry. | Makino Inc. | 513-573-7200 | makino.com | Valley Tool | 662-473-3066 | valleytoolinc.com Valley Tool continues to invest in new machining equipment. For example, it purchased two Sodick EDMs—one wire and one sinker—in 2017. Some parts run across both the HMCs and the EDMs. Continued investment in new machining technologies demonstrates to employees the shop's commitment to growth and continuous improvement.